At the beginning of October, Gummy and I decided to make an effort to try and use up samples. I suspect everyone else did better than I did, but oh well - check out that original post here. 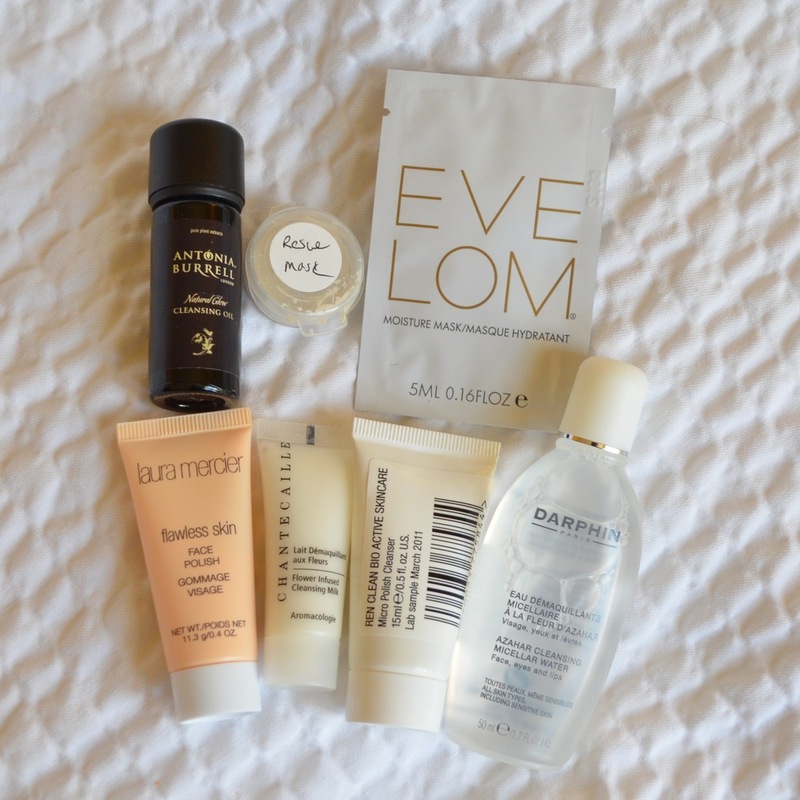 Here's a look at my empties from the October Sampler - not bad, I think?? Read on to see how I did and what my highlights were! As you can see from the before and after pictures below, I didn't get very far on this one. I only managed to use up the Jo Malone Orange Blossom Hand & Shower Gel, which I quite liked. The Orange Blossom perfume makes me sneeze, but in shower gel form I quite like the scent! Not sure if I will buy it though, as it is quite expensive. 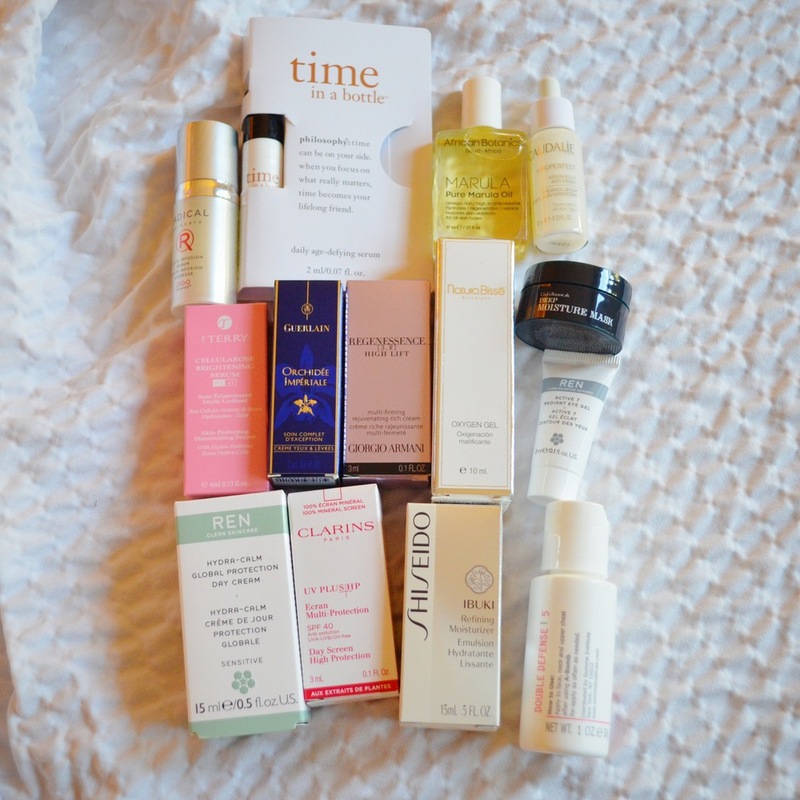 I liked the Sunday Riley Cleansers, and I enjoyed the Omorovicza as well, but I'm really hoping I like less expensive cleansers too. I tried a sample of Skinfood Honey Black Tea Jelly Foam Cleanser, but they were sold out when I went to buy it and I picked up the Cleansing Milk instead. Since I had an extra tube of Ren Micro Polish Cleanser, I gave that to a coworker. I also kind of liked the Chantecaille Jasmine & Lily Healing Mask but I'm afraid to even check how much that costs! I managed to use up a good number of these, I think! 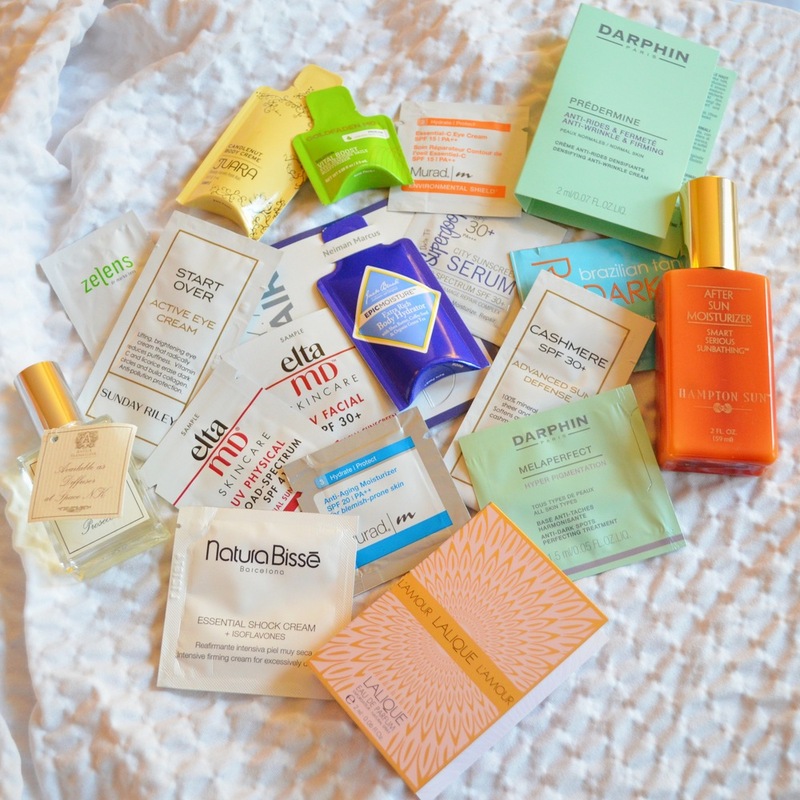 I gave away the Ren and Shiseido because they didn't work for me, and I managed to use up a few too. I didn't care for the Armani which seemed very artificially fragranced, and I think the Guerlain eye cream even made my eyes itch. Yuck. I used up the Caudalie Vinoperfect Radiance Serum, and that really didn't seem to do anything either and it barely seemed to moisturize. I may consider the By Terry Cellularose Brightening Serum however, because I suspect it helped my dehydration and redness. It was harder to get through these than I thought, but I managed to give a way the Armani Maestro and Givenchy Mister Light samples. 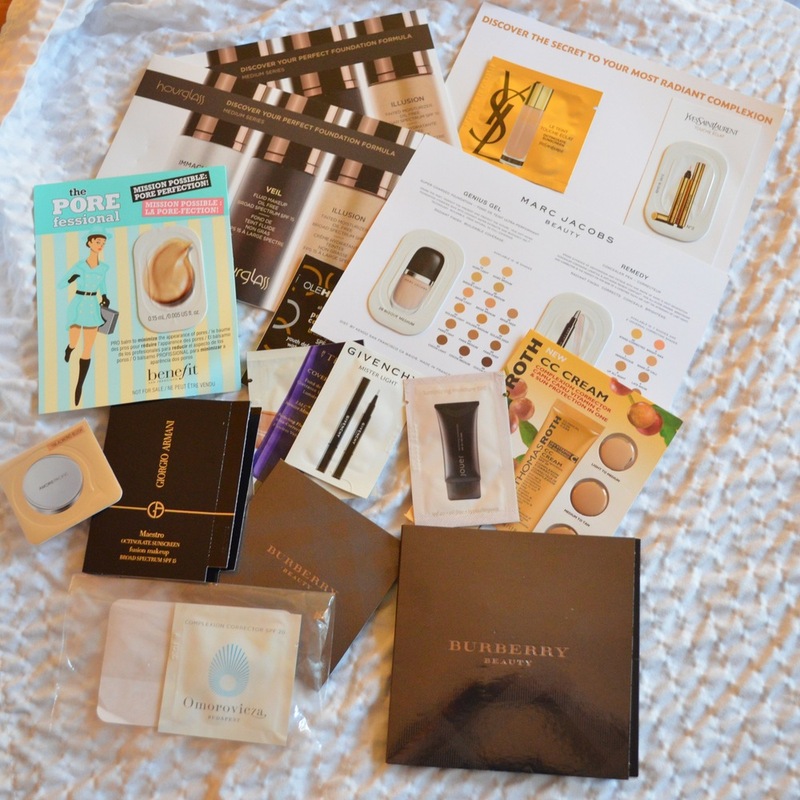 I was surprised by the limited shade selection of Burberry Sheer Concealer, and I actually liked the Peter Thomas Roth CC Cream, which I may actually buy if the light shade is appropriate for me. I really didn't get on with the Marc Jacobs Gel Foundation (icky finish) and I may take another look at Benefit the Porefessional. What do you think of the October Sampler? Did any of these samples catch your eye? How do you manage to use up samples?